A fascination with sexuality and fashion is a base of Cary Kwok’s work. 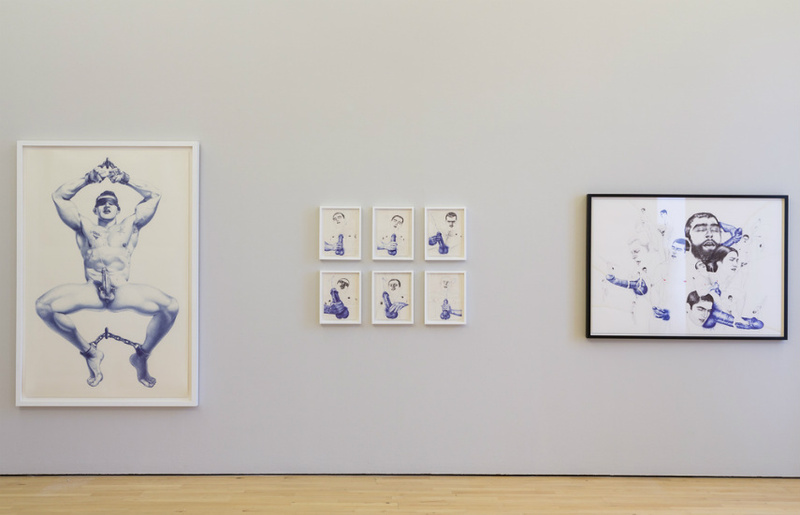 The subject matters of his work vary from women’s shoes, fashion costumes, hairstyles, to male bodies, with an accent on gender and sexual equality. Kwok’s distinctive style is sometimes provocative and open-minded, but he has never had the intention to shock the audience. Passionate about his work, he is not expecting everyone to understand it. The message behind these drawings is often personal to him. Kwok’s Chinese origin is permeated with his European and Britain experience making him an artist who celebrates differences and promotes racial, ethnic, sexual and gender equality in his work. His obsession with the male body represents the fascinated scenes of male strength through their muscle and ejaculating penises. He celebrates cartoon and movie heroes – Superman, Popeye and Santa Claus, Hollywood heroines, such as Audrey Hepburn or Miss Piggy. Because of the artist’s sexual preferences, the male body always has a sexual connotation, but female characters are mostly connected to fashion, costumes, makeup and hairstyles. For his series of small drawings of penises, Kwok had an intention to incorporate pubic hears in his work. He was collecting hears from his friends, but then realized that those hears are too short for any hear style, so he decided to use head hear. The penises, which belongs the fictional characters, represents the portraits of real men. In every piece of his work, Kwok celebrates differences, with the humor as essential part of it. Cary Kwok was born in Hong Kong. He studied fashion at Central Saint Martins College in London where he graduated in 2001 with an MA in Fashion Design (Womenswear). His work has been exhibited in many of the world’s private galleries from London to Miami, Tokyo, New York, Zurich and Geneva. 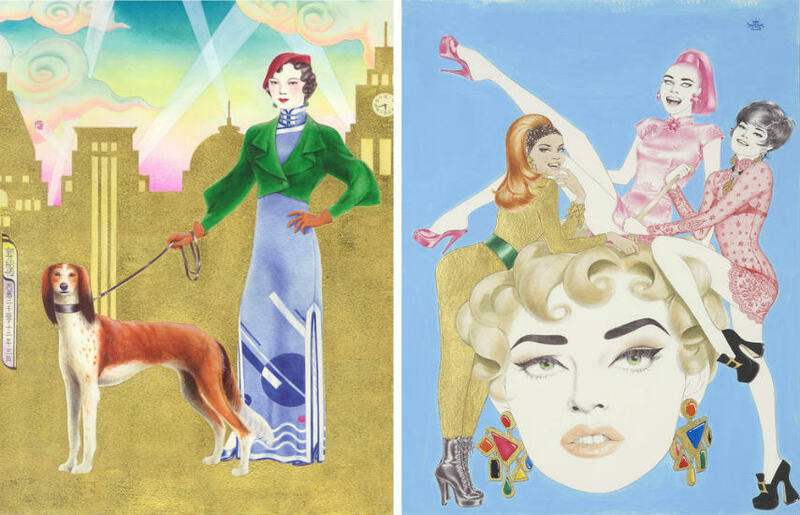 Resurrecting old Hollywood stars and cartoon heroes Kwok’s pen drawings are coming into fashion and pop culture, revealing his obsession with historic style in the world of fine arts. He is inspired by male and female beauty. Reconsidering equality in a humoristic way, he is admiring human body. 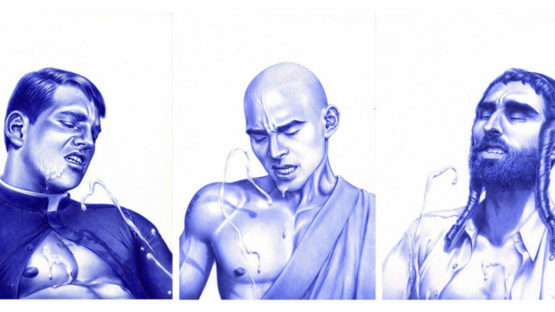 Drawing from his own imagination and sexual fantasies, Kwok breaks the taboos. His life in the UK as ethnic minority gave him the opportunity to see himself in a different way and possibility to express the essence of equality trough his work. The artist is represented by The Cat Street Gallery. Cary Kwok lives and works in London.